In several previous posts, we have explained how the GINI index can be used to quantify the degree of income inequality within a population or country. The higher the GINI index, the more inequality there is. National comparisons of inequality are usually based on working out the GINI index for countries using their residents’ gross (pre-tax) incomes. However, it is also possible to calculate the GINI index for net incomes, incomes after taxes have been taken into account. This enables economists to assess the impact of tax systems on income distribution (and income inequality) in a country. The graph below (Figure 2 from Brown et al, 2013) shows pre- and post-tax income GINI coefficients for a selection of countries, including the larger economies in Latin America. In the European countries, such as Belgium and Sweden, on this chart, the GINI coefficient after tax (dark bars) is much lower than the GINI coefficient before tax (light-colored bars). This means that the taxation system has led to less income inequality than existed prior to taxation. In general terms, this means that the tax system is (overall) a progressive one [i.e. one where taxes take an increasing proportion of income as income rises]. In Latin American economies, a different picture emerges. With the exceptions of Brazil and Costa Rica, the GINI coefficients after taxes are taken into account are actually higher than the GINI coefficients before tax, meaning that income inequalities have become greater as a result of the tax system. 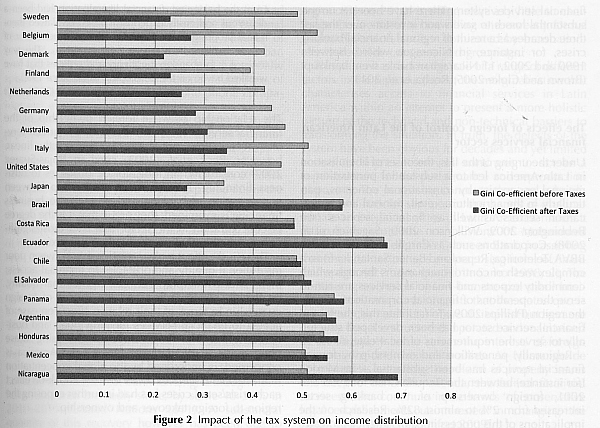 In general terms, these tax systems are regressive [where taxes take a decreasing proportion of income as income rises]. In Brazil and Costa Rica, the levels of income inequality remain unchanged after taxation is taken into account. Clearly, if reducing income inequality is a priority for Latin America, then something has to change. Whether a nation prefers a tax system that is regressive or progressive is a question of political beliefs and policy, as well as a question of economics. It should be noted that the chart is based on calculations using data from 2012 or earlier. It will be interesting to see how Mexico’s recent major fiscal reforms impact its GINI coefficient in the coming years. Will the recent reforms lead to a more equitable situation and reduce the GINI coefficient, or will they foment greater inequality of income, making the rich richer and the poor poorer? The exact methodology used to derive the post-tax GINI coefficient is not clear in the original article. In particular, it is unclear whether or not the after-tax income in the chart includes the large number of Mexican workers in the informal sector who generally do not pay any income or payroll tax. “Towards financial geographies of the unbanked: international financial markets, ‘bancarization’ and access to financial services in Latin America” by Ed Brown, Francisco Castañeda, Jonathon Cloke and Peter Taylor, in The Geographical Journal, vol 179-3, September 2013, 198-210. Carlos Slim Helú , director of Grupo Carso, continues to head the list of the 10 richest Mexicans, despite his fortune declining in 2013 due to the falling value of his holdings in Frisco mining company and América Móvil. Slim Helú was overtaken as the world’s richest person in 2013 by Bill Gates. According to Forbes magazine, between them, these ten Mexicans have a fortune of 132.9 billion dollars, equivalent to 11% of Mexico’s GDP. Germán Larrea, mining, 14.7 billion dollars. Alberto Bailleres, mining, 12.4 billion dollars. Ricardo Salinas Pliego, Grupo Salinas (TV Azteca, Elektra, Banco Azteca) 8.3 billion dollars. Eva Gonda de Rivera, Coca Cola-Femsa shareholder, 6.4 billion dollars. María Asunción Arumburuzabala, former president of Grupo Modelo, 5.2 billion dollars. Antonio del Valle Ruiz, Mexichem, Pochteca y Banco Ve por Más, 5.0 billion dollars. Jerónimo Arango, whose family founded Aurrerá, 4.2 billion dollars. Emilio Azcárraga Jean, Televisa, 2.6 billion dollars. David Peñaloza Sandoval, construction firm Triturados Basálticos (Tribasa), 2.1 billion dollars. Gross National Income (GNI) per person (on a Purchasing Power Parity basis, which uses the total amount of goods and services produced in an economy, independent of exchange rates). The HDI theoretically varies from 1.0 for the highest and 0.0 for the lowest. In the 2013 report, Norway is highest with a score of 0.955 while Congo and Niger are tied at rank 186 for lowest with scores of 0.304. The latest report identifies Mexico along with 17 other countries that have made outstanding progress since 1990. This group of 18 includes none of the traditional industrialized countries. Those at the top of the progress list include South Korea, Chile, Mexico and Malaysia followed by such major countries as Brazil, Turkey, Thailand, China, Indonesia, India and Bangladesh. The HDI scores of all the world’s countries have improved significantly in the last 30 years; but the scores of non-western countries have increased spectacularly over this period. 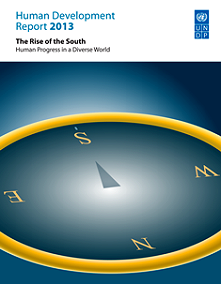 While HDI scores receive considerable attention, the UNDP’s Inequality-Adjusted HDI or IHDI is a better overall measure because it is far less skewed by the extremely wealthy whose very high incomes push up the GNI per person values but do not adequately represent the development of the society as a whole. For example, the USA ranks third in HDI with a score of 0.937, due in part to the extreme wealth of its highest 1%. On the IHDI scale, the USA scores only 0.821 and ranks 16th. Mexico’s HDI score is 0.775, but its IHDI score is of 0.593 is much lower because of the great inequality between the rich and poor in Mexico. In terms of IHDI, Mexico ranks 55th. This places Mexico well behind Chile (41st, 0.664), Argentina (43rd, 0.653) and Russia. (2012 data are not available for Russia, but 2011 data places it well ahead of Mexico.) On the other hand, Mexico’s IHDI score is ahead of Peru (62nd, 0.561), Turkey (63rd, 0.560), China (67th, 0.543), Brazil (70th, 0.531), Indonesia (79th, 0.514) and Egypt (0.503). Major countries that seriously trail this group include: India (91st, 0.392), Bangladesh (95th, 0.374), Pakistan (98th, 0.356), Kenya (102nd, 0.344), Nigeria (119th, 0.276) and Ethiopia (121st, 0.269). The main conclusion is that the overall quality of life continues to improve rapidly in Mexico as well as in many other so-called developing countries. Current trends suggest these improvements will continue in the years ahead. The Congo, ranked 134, is last with a score of 0.172. IHDI scores are not available for many countries because they lack appropriate income distribution data. The 2013 Forbes list of the world’s billionaires shows that the world’s 1,426 billionaires (an all-time high) share a record net worth of $5.4 trillion. The four countries with most billionaires are the USA (442), China (122), Russia (110) and Germany (58). #32 Alberto Bailleres González and family, $18.2 billion. Mining giant Peñoles, department store El Palacio de Hierro and Grupo Profuturo. #40 Germán Larrea Mota Velasco and family, $16.7 billion. Grupo México –mining for copper and other minerals, railways. #111 Ricardo Salinas Pliego and family, $9.9 billion. Television company Televisón Azteca, domestic appliance store Elektra, bank Banco Azteca, and cell phone company Iusacell. Conspicuous by his absence from the list (for the first time in several years) is Joaquín Guzmán Loera (aka “El Chapo”) who Forbes has consistently claimed has a net worth of about $1 billion, but whose assets the magazine now declares “impossible to verify”. Guzmán Loera is Mexico’s most wanted man, head of the Sinaloa drugs cartel, the main supplier of cocaine to the US market. The combined total wealth of these fifteen individuals is a staggering $148.5 billion (compared to an equivalent total of $125.1 billion in 2012). The 2013 figure is equivalent to more than 6% of Mexico’s GDP. The average earnings of Mexican workers registered in IMSS (Mexico’s Social Security Institute) in 2012 was about 260 pesos ($20 dollars) a day. The combined wealth of Mexico’s fifteen richest individuals/families is therefore equivalent to the total annual salaries of more than 20 million Mexicans earning this average salary! Note that this equivalence has risen steadily over recent years. For example, in 2010 the combined wealth of Mexican billionaires was equivalent to “only” 14.3 million Mexicans earning the then average salary. Chapter 29 discusses Gender inequities in Mexico and Oportunidades, a poverty reduction program (links are to excerpts from that chapter). In general, Mexico’s larger states (in terms of population) contribute more towards national GDP than its smaller states. Equally, even after population is taken into account, it is clear that some states contribute far more than others to Mexico’s GDP. The states of Campeche and Tabasco both stand out as contributing far more than their fair share towards national GDP; this is on account of their oil and gas reserves. The Federal District, Nuevo León, Quintana Roo and Querétaro also outperform in terms of economic output. 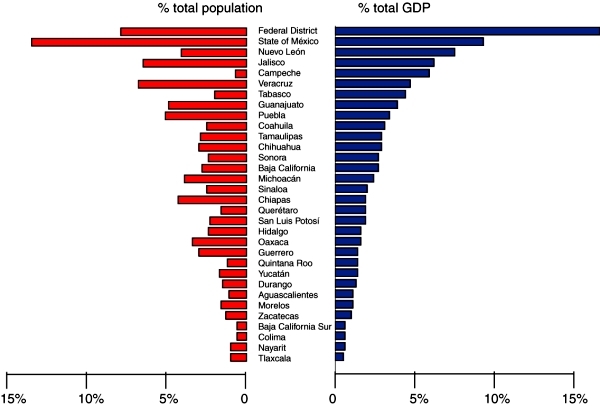 On the other hand, Michoacán, Chiapas, Oaxaca and Guerrero all stand out for contributing less to Mexico’s GDP than the size of their population would suggest. The economic disparities revealed by the data are closely matched by other indicators of economic disparity such as differences in poverty rates and the distribution of the wealthiest households. For more about these topics, start with the related posts listed below. More than half (51.3%) of Mexico’s total population of is female. (There are 94.8 men for every 100 women.) However, with isolated exceptions, Mexico has been a male-dominated society for a long time and the spirit of machismo is still very strong in many parts of the country. There is ample evidence for this. For example, Mexico has never had a female head of state and very few female cabinet members have ever been appointed. There have been very few female candidates for president; they include Cecilia Soto González (1994), Dora Patricia Mercado (2006) and Josefina Vázquez Mora (2012). [Thanks go to Manuel and other alert readers for correcting an earlier version]. In business, male executives earn more than their female counterparts, though the wage differential is much smaller for lower-paid positions. There are also vast differences across the country in the economic and social well-being of women. Some women, such as billionaire María Asunción Aramburuzabala, have proved that Mexican women can be incredibly successful in business, yet tens of thousands of women face a daily struggle against starvation and violence in the home. The precise roles of women in Mexican society vary greatly from one region to another. The indigenous Zapotec community of Juchitán in the Isthmus of Tehuantepec region of Oaxaca is at one extreme. It functions as a matriarchal society where women play a much more important role than men in trading and decision-making. Juchitán is also possibly the most tolerant place in Mexico in terms of attitudes to the gay and transgender community, especially to transvestite men, locally called muxes (pronounced moo-shays). A 5-minute video, The Third Gender, produced by Deborah Bonello for GlobalPost, explores the extent to which the residents of Juchitán accept cross-dressing muxes as an integral part of society. Veteran blogger Matt Osborne has unearthed a real gem! This 1977 BBC documentary was the tenth episode of The Age of Uncertainty, John Kenneth Galbraith’s history of economic thought. In this episode, Galbraith examines the economics of poverty and inequality. The section of greatest interest to Geo-Mexico readers is his overview of the changing relationships between land and people in Mexico from precolonial times to the 1970s. [This ten minute segment starts at minute 4:33 of the video]. Galbraith does confuse his Teotihuacanos with his Aztecs, and clearly many things have changed since 1977, but this video is a great and straightforward introduction to the complex issues of land resources and population, suitable as the starting point for many discussions at high school or college level about land clearance, the financing of land improvement, the Green Revolution, population growth and social organization. Trends in income distribution in Mexico: are the poor getting poorer? A recent OECD (Organisation for Economic Cooperation and Development) study – “Divided We Stand: Why Inequality Keeps Rising” – shows that in the last 25 years, the “real” (adjusted for inflation) income of the richest 10% of Mexican households has risen by 1.7%, compared to only 0.8% for the poorest 10% of households. The gap between rich and poor for OECD members is at its highest for 30 years. Mexico has the dubious distinction of being the OECD member with the second largest gap in household incomes, exceeded only by Chile. The average income of the richest 10% of households in Mexico is now a staggering 26 times higher than the average income for the poorest 10% of households. To quote the OECD report: “The income gap has risen even in traditionally egalitarian countries, such as Germany, Denmark and Sweden, from 5 to 1 in the 1980s to 6 to 1 today. The gap is 10 to 1 in Italy, Japan, Korea and the United Kingdom, and higher still, at 14 to 1 in Israel, Turkey and the United States.” The mean value for all OECD members is slightly less than 9. In 2008, the richest homes in Mexico had an average income of 228,900 pesos (about 20,800 dollars at the then exchange rate), compared to just 8,700 pesos (790 dollars) for the poorest 10% of homes. In the past two decades, Mexico has made very impressive progress in providing electricity to its citizens, especially those living in rural areas. 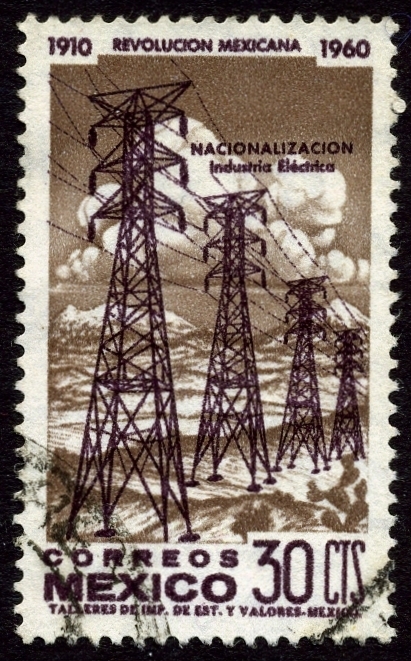 The 87.5% of Mexicans that had electricity in 1990 lived mostly in cities and towns. Many of the 95.0% that had electricity in 2000 lived in rural areas. The proportion without electricity was cut way down to only 1.8% by 2010. During the past decade, virtually all those who obtained electricity for the first time lived in rural areas. The gains in some states were very impressive. The proportion without electricity in Oaxaca went from 13% in 2000 to 5% in 2010. In San Luis Potosí and Chiapas it fell from 12% to only 4%. In Veracruz it dropped from 11% to just 3% and in Tabasco it went from 5.8% to only 1.2%. The states with the highest proportion without electricity in 2010 were Oaxaca (4.93%), Guerrero (4.38%) and Durango (4.19%). At the other end, were the Federal District (0.08%), Nuevo León (0.30%), Coahuila (0.54%) and Colima (0.59%). Mexico may never be able to provide electricity to 100% of its citizens, since there are too many people living in very remote areas. In about 8% of municipalities (199 of 2456), more than 10% of the people lack electricity. Of these 199 municipalities, 81 are in Oaxaca, which has 570 municipalities, far more than any other state. Many of the other poorly serviced municipalities are in the relatively poor southern states of Guerrero (15), Veracruz (12), Chiapas (9), Puebla (7) and Michoacán (7). A surprisingly number of these 199 municipalities are in two northern states: Chihuahua with 16 and Durango with 9. In fact, in 14 Chihuahua municipalities, over 25% of the population lack electricity and in 5 of these over 50% do not have electricity. In Durango the situation is only slightly better: in four municipalities over 25% lack electricity and in one of these 66% do not have electricity. These are among the worst-serviced communities in all of Mexico. In the whole country there are only 9 municipalities where over half the residents do not have electricity and 6 of these 9 are in Chihuahua or Durango. These very poorly-serviced areas are sparsely populated municipalities near the Copper Canyon, occupied mostly by the Tarahumara indigenous group. Though there are sizable pockets of Mexicans that do have electricity, it is very impressive that, as of 2010, over 98% had access to power. CONAPO, “Índice de marginación por entidad federativa y municipio. 2010” México D.F., October 2011.